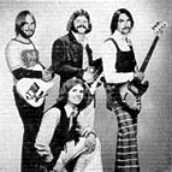 The band got together in the halls of Oak Harbor Washington's High School in Oct of 1971 and played and rehearsed four nights a week without fail until May of 1974. At it's best Warbuck was number five in Jim Smith's Unicam agency of Lynnwood when Seattle's Rail was number one. Paul Short played with Warbuck for two years until the FBI showed up one day looking for him. It turned out his name was really Roger Trinen, and he'd unknowingly left the Army before he was completely discharged, and was considered an AWOL As the story unfolded, a friend of mine was traveling the country and ran into "Paul" at a bar and they got too talking about where he was from, Whidbey Island. "Paul" had wanted to come here since he was a kid and so, when my friend said, "well?...do you want to go because I'm headed there now"
Paul thought he was as good as done with the army, so went with my friend Frank to Whidbey Is. Warbucks bass player had gone to play with Shadowfax, and Via the local whidbey Is' Monkey hill gang...not really a gang, but a bunch of neighborhood kids from North Whidbey, which Paul had become roomies with. I was at their house and Paul mentioned he had played bass. I told him we were looking for a bass player and low and behold he was as solid a bass player as I'd ever played with. I took him to the local music store and he bought a Gibson EBL bass and to the gig we went. Paul was a great bass player and I hung with him a lot, but when the FBI showed up they put the pressure on me to reveal where he was, and I do mean pressure. Heck I was only 16 or 17 at the time. I led them to him believing he would be better off in the long run as the FBI doesn't stop once they have a booking. He had to go to Fort Lewis for a few months to fulfill his remaining obligation, and Ted Reindal took his place. P.S. Warbuck in it's original config is back together as The Stu Pidman Band.